A tradition Nathan and I started when we were dating was add a new ornament to our tree each year. Something that reminds us of that particular year. Last year, we couldn’t find any store ornaments that represented our year, so I decided we would make our own microwaveable salt dough ornament. It was quick and easy with only THREE ingredients for the dough. If you make something using this tutorial, please upload pictures of it in our Flickr group to show it off to everyone. You may be featured on Simply Modern Mom. 1. In a bowl, mix together the three ingredients – flour, salt, and water. Mix well, then roll flat on a flat surface (counter or table top). 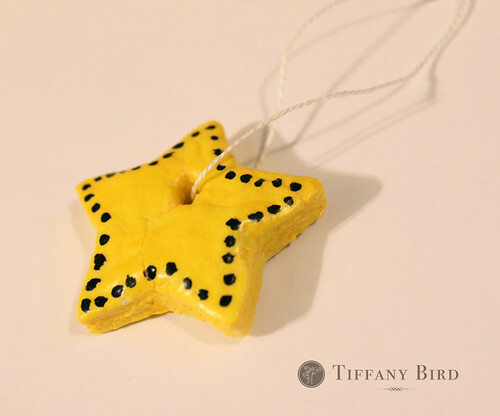 You will want the ornaments to be less than 1/2″ thick. 2. Using cookie cutters, cut out the ornaments. 3. Use the toothpick to make a whole at the top of the ornament to string ribbons through for hanging. 4. 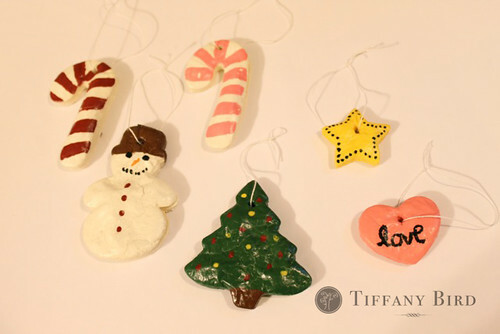 Place similar sized ornaments onto a microwavable glass plate. Heat in microwave until water has evaporated from the mixture. And since all microwaves are different, I would start out heating 2 minutes, check it, then continue in 30-second or 1-minute increments. If you heat too long, the top and bottom of the ornaments may start to brown. A little browning may be OK if you use a darker paint color over it. And most ornaments will crinkle a bit at the top. There is not much you can do about that except sand it down later. The ornaments will be extremely hot. 5. Allow the ornaments to cool on the cooling rack. Then paint. 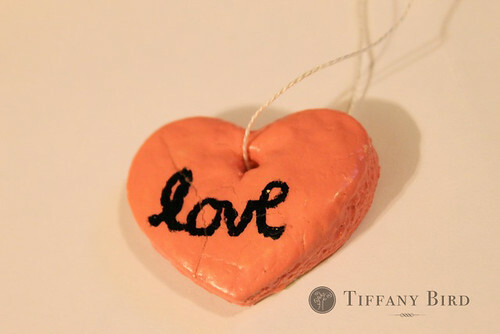 Once the paint is dry, you will want to seal it with a couple layers of Mod Podge. 6. String a ribbon through the hole and hang on tree. Seriously Tiffany, is there anything you CAN’T do? 🙂 Cute ornaments! Thank you for the recipe!! Such cute ornaments! My boys would have so much fun making them! Cute ~ my kids will have a blast making some of these! Thanks! This is a great way to memorialize each year! What a fantastic idea. Cool! I never knew they could be microwaved. I always baked them in the oven. If you want, click on my name and check out my bread dough ornaments. When my daughter was a little girl we used to make them. Those look fun! I also like making Cinnamon ornaments using equal parts cinnamon powder and elmer’s glue. The dough is a little trickier to work with and they are a little more fragile, but they smell divine! These are too cute! I love them, how fun! Thanks for sharing! I LOVE that you used the microwave! My kind of project! IN THE MICROWAVE!! Way clever! It makes them even more kid friendly! Thanks for leaving the link !